No, time is not passing even faster than usual; I skipped out on the Makery altogether last week. 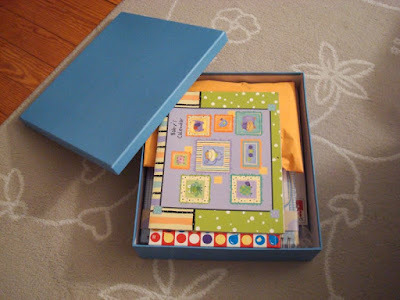 I did actually manage to make a wee bit of progress on the whole operation declutter mission, whittling down a box of random stuff from Elias's first 11 months into this very neat and tidy scrapbook storage box. Ah, much better. Nothing to give away there, though, unless, of course, you'd like a banker's box shredded by Xander (why is a cardboard box always more compelling than the multiple cat posts we've purchased precisely for this purpose?). This week, however, since I've been busy the past couple of weeks crocheting a boa-type scarf (just in time for summer! 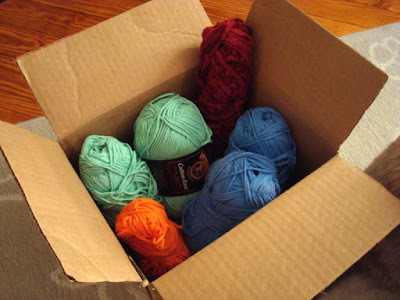 ), I thought I'd go through my various craft bins and get rid of leftover yarn. The maroon chenille is leftover from said boa, and the rest of the yarn (minty green, light blue, and a bit of bright orange cotton yarn) I bought initially for this blanket and subsequently tried to use up making these coasters and then more coasters. 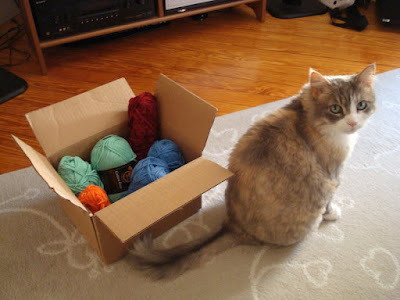 If you think you can get a little life out of this box o' yarn (Sophie not included), leave me a comment on this post and I'll enter your name in the random drawing I'll do at the end of the week. As for that boa, it's taking me way longer to make than I thought it would and I even had to run out and buy more yarn to finish it (which is ironic since the only reason I'm making it is to use the first skein of chenille yarn I had on hand that I bought a couple of years ago when I thought I'd try to teach myself how to knit...turns out I'm a one-hook kind of crafter). I'm still deciding whether I'll keep it or give it away but stay tuned for that. 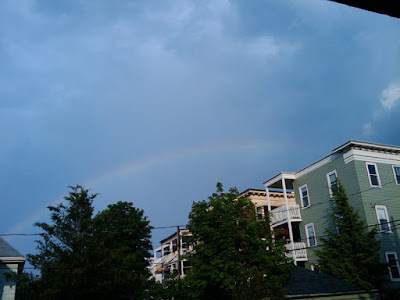 The first rainbow of the season, as seen from our front porch as a thunderstorm passed through. The skies were indeed pretty dramatic as they tend to be this time of year as we returned from our mid-day "adventure" with the little one. 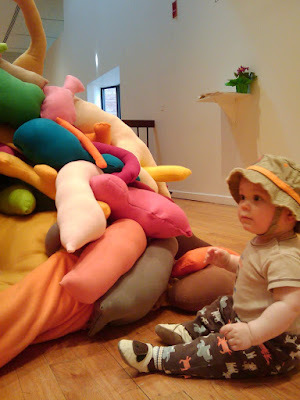 We took him to the Tufts University art gallery to check out the final MFA thesis show of the year. I took him to the April show as well but I definitely didn't want to miss this installment, knowing that the show included an interactive sculpture by Elizabeth Amento, an artist I mostly know as a painter. 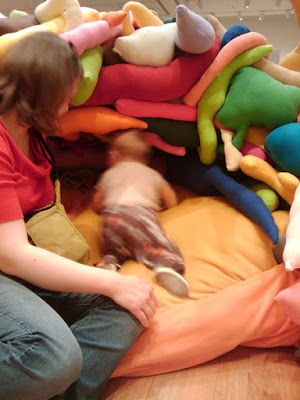 I enjoyed how surprisingly different the installation was from the work she was making when I had a more regular presence at SMFA and yet undeniably from the same artist. I think Elias liked it, too. Nope, I didn't make this. 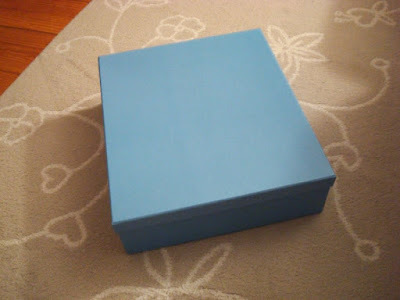 Actually, I didn't make any of the stuff included in this week's project, a relaxation/sleep kit I put together for the first of a series of special relocation edition Makery posts. Nothing's final, but it's looking more and more likely that the family and I are going to say farewell to Boston this summer. It feels a little like the end of a slightly disappointing weekend in Vegas. I have no regrets - there are a lot of good things that have happened during the four years we've been here, and we always imagined we'd return to the west coast eventually, but professionally, for me at least, it's just not happening. More on that as it unfolds. In the meantime, as you might imagine, I'm pretty busy going through stuff, getting rid of stuff, and starting to pack stuff. Even if we switch gears in the next couple of weeks, seriously tackling the clutter situation here will be a good thing. 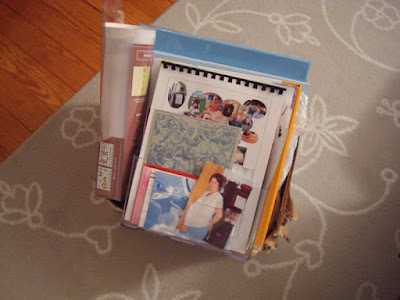 I may still make things from time to time, but for the most part, you can expect posts about what fun reorganizing project I've tackled that week, which may or may not involve a giveaway of some sort. On that note, what I have to offer this week is primarily based on a sleep kit Neal brought home from a business trip several months ago. In addition to the audio CD, sleep mask, linen spray, and ear plugs, I've thrown in a body lotion sample from Victoria's Secret and a tea bag/coaster kit I picked up in Sisters, Oregon. Funny story, actually. I bought a couple of these handmade coasters to give as gifts to two of my in-laws, but several months after giving the first away, I couldn't remember who I'd given it to and didn't want to accidentally give the same thing to the same person twice. So it made its way to the bottom of my bag of gift wrap, gift boxes, and, occasionally, random gifts until I rediscovered it yesterday. 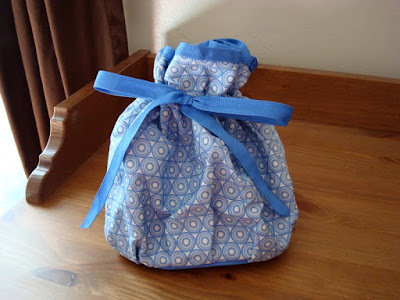 The bag was part of a lovely graduation gift last year but the truth is I have all the toiletry bags I need so rather than toss this, I thought I'd use it to keep all the parts of this little kit together. If you need a compelling reason to catch up on your sleep or just relax one weekend afternoon in the near future, leave me a comment on this post and I'll enter your name in the random drawing I'll do at the end of the week. 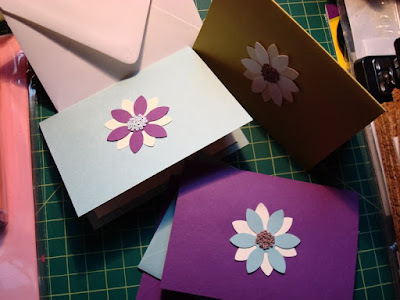 With Mother's Day fast approaching and a limited budget, I decided to make a small set of notecards for my mother-in-law. You know how much I enjoy the embroidered French knot, and I saw somewhere how someone had used the delightful little stitch to create the center of sunflowers and such made from fabric. So I decided to give it a try using paper, and it worked out pretty well. 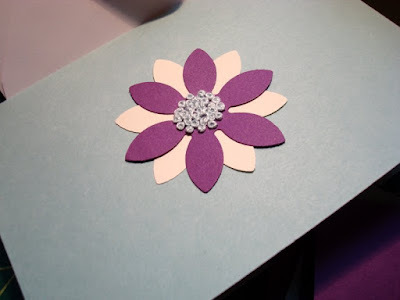 As with anything else, the third flower was a bit better than the first one I tried, but overall, I was pretty satisfied with this small set of three notes in green, blue, and purple. I may have to make another set to sell in my Etsy shop (like the mini thank you's that have yet to make their way there!). Although I had about three or four ideas for the Makery for this week, sadly, it doesn't look like any of those projects are going to be realized in time for my usual Monday deadline. I spent too much time last week embroidering animal-shaped pieces of felt, was away for the weekend, and have too much to do today. Sigh. I'm actually a little surprised I was able to keep it up for eleven straight weeks before taking a brief hiatus. I hope to get back on track this week and have something fresh to post next Monday. In the meantime, congrats to Java Diva. You won last week's miniature thank you notes. Email me your address and I'll pop those in the mail to you within the next couple of days!